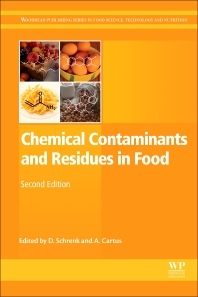 Chemical Contaminants and Residues in Food, Second Edition is an invaluable tool for all industrial and academic researchers involved with food safety, from industry professionals responsible for producing safe food, to chemical analysts involved in testing the final products. This updated edition is expanded to cover the latest research and emerging issues, and has additional information useful for food safety testing. Written by an international team of expert contributors, this edition explores the entire food chain, acting as a roadmap for further research. Dr. Alexander Cartus is Assistant Professor at the Institute of Food Chemistry and Toxicology at the University of Kaiserslautern, Germany. He leads a research team focusing on the toxicological properties and risk assessment of food constituents, especially naturally occurring compounds like alkenylbenzenes.